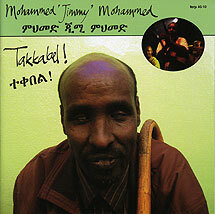 Mohammed 'Jimmy' Mohammed, vocals; Mesele Asmamaw, krar, backing vocals; Asnake Gebreyes, drums, backing vocals; Han Bennink, drums (tracks 1, 3, 4, 6, 8); Getatchew Mekurya, saxophone (tracks 2, 3, 5); Massimo Zu, bass (track 1). Recorded 6/7/10 May 2005 at Jottem, Wormerveer, Holland. Front cover photograph (reproduced above) by Emma Fischer; layout and artwork by Jos Kley, Emma Fischer.